Although existing in more nebulous forms for hundreds of years, an organization recognizable as the current Black Sun was first mustered under the Dark Princess Gabriella Storm. Its business front opened to the galaxy on Year 0 Day 5 (CGT). Though ostensibly a reputable trading concern, the core of the group was to become one of the most feared social clubs in existence. According to accounts from the period the first Princess eventually grew bored with continuing success and faked her own death in order to escape the group (Year 0 Day 318). The existing pattern of loyalties, when confronted with the sudden departure of the Princess, created a rift in the organization. Many who were loyal to the Princess reasoned that where their leader went they must follow and so they departed. For the first time the leadership of the Sun was shaken and the organization set to tear itself apart. Loyalty games are almost always devastating. They divide groups along the faults lines of who/what members are actually loyal to. Then come the other reasons; Those members who are ambitious or greedy are lured towards opportunities they see opening and those who are fickle are motivated just by the desire for a change. The damage is, generally, far worse than expected. Such times are treacherous and a leader is required to stabilize what is left. Dark Prince Blood was appointed in the interim and, though he never wanted the job, he did his best at a holding action until a new leader could emerge. After long deliberation among stakeholders in the high command a new Prince was chosen, Dark Prince Keevan Colton, who pushed towards stabilizing the high command and the organization as a whole. Again, the new leader was a reluctant Prince and quickly set about training a successor. This successor was Dark Prince Qel Dar. He propounded the philosophy that the Sun's power must become centralized and became known for military-level conflicts with the Hapes Consortium. The reasons for the dispute between Black Sun and the Hapan government are lost to time as no member involved still serves the Family today. What is known is that Prince Dar was a member of the Huruk-Rah clan and drew the Sun closer to the Falleen Federation. The Federation was, at that time, led by Tholin, a sentient with ties to the syndicate. Qel Dar also took as his protégé the galactic businessman Kosh Naranek who was former governor of Lorell. Together, they pushed construction on the planet in an effort to wrest control from Hapes (Year 3 Day 107, CGT), ultimately leading to a military intervention that foiled these plans. Despite his other works as Dark Prince, Qel Dar's plan to seize the planet Lorell was his most grandiose action and his failure there irrevocably marred his reign. He would abdicate within half a year after the conclusion of what the Hapans now call the "Black Sun Crisis". Naranek, the expected successor, had disappeared from the galactic stage when Dark Prince Dar stepped down and so the task of rebuilding passed to Plojo Rosom (ascended to the throne Year 4 Day 61). Dark Prince Rosom set out to reconstruct Black Sun, dividing the corporation up and appointing Lords, each with the responsibility of conquering volumes of space. Each of these taskforces would be a microcosm of the way Black Sun itself had been run in the past and the Family grew to its largest point since its inception under Dark Princess Storm. Freed from the day-to-day management of territory and assets the Prince could take on larger issues and those of personal interest. Dark Prince Rosom married Avalon Larkin on Year 4 Day 159. Realizing the Sun's need for military muscle, Rosom contracted mercenary groups among these was Irv Howie, a petty warlord based in the Jospro sector. This mercenary's relationship with Tee ubo Tarkona (then fiancé to the Emperor Uebles) drew him into conflict with the Galactic Empire. Tee fled Imperial space aboard her YV-666 the "Leap of Faith" to join with Howie's fleet just outside the Sullust system, it was here she changed her name and appearance to avoid pursuit. Tee became Xyanax Jasper and then Xya Howie after the pair married and combined their resources into a new group, the Shadow Walkers, which was hidden from those who were not members. Using her connections in the Empire she lured a Victory-class Star Destroyer the flagship of 2IF "Dauntless" to the Sullust system. Here they were ambushed by elements of Warlord Howie's fleet, notably the Carrack-class light cruiser "ISS Golgotha" which was loaded with troops, ready to storm the Destroyer. After a fierce battle the ship was captured and renamed the "ISS Chosen" to serve as flagship of Howie's fleet. Disputes between Xya and Irv caused the marriage to decay. Xya took those Shadow Walkers loyal to her into the service of Black Sun, while Howie returned his fleet to mercenary work. The Shadow Walkers were initially employed by Dark Prince Rosom as an external group to remove Family members who broke their pact with the Sun. Incorporating Xya and Tara Tylger into Black Sun caused diplomatic strife with the Empire - the Emperor hated the pair, for personal reasons and for their involvement with a group which stole a Star Destroyer and murdered its crew. Hostility led to war and Black Sun found itself at war with a large government once again. After a small altercation on Tatoonie, Black Sun rose to meet the new challenge. Ultimately, neither faction could claim to have won the conflict and, after diplomatic success, it was downgraded to a state of mutual animosity. Xya was still tasked with reporting and eliminating Family members who betrayed Plojo and her personal records suggest that as Plojo grew more paranoid she grew to hate the work. Prince Rosom finally merged the Shadow Walkers into the mainstream of Black Sun and left, appointing her the Dark Princess. The agenda of Dark Princess Xya was to push omniscience through connections with factions and to push illegal money making with the creation of the Black Market. Her initial reign lasted just over eight months. The Black Market was set up to sell rare and expensive technology anonymously through Black Sun as an intermediary. Silent auctions meant that pirates could flog their stolen goods to upstanding citizens without anyone stopping to pick up moral scruples. The two principal sources of military goods for the Black Market were Emperor Uebles (who was faced with the prospect of either, working with BS, or continuing hostilities with them) and Irv Howie (who maintained volatile relations with the Princess and her organization). "Being everywhere and knowing everything at any given time." - Princess Xya Howie, Kiffex Palace, Year 5 Day 160. The fourth, and final group involved was to be SoroSuub. Irv had funneled his personal wealth into the creation of the SoroSuub Conglomerate along with his new business partner Adam A Flynn. Together they were pushing forward what would become the largest, richest group of businesses the galaxy had seen. The SoroSuub shipbuilding company was a gift to the pair from Black Sun so, from the start, they were indebted to the organization. SoroSuub began its golden age around Year 5 Day 181 (CGT) and by this point it was very loosely interwoven into the Sun. When Princess Xya Howie stepped down her loyal Regent Joseph Roscha was appointed Dark Prince. His reign was short, only three months, before continued disagreements with the former Princess prompted a turn of events that saw him expelled from the group and Dark Princess Xya's return to the throne. While Count Irv Howie of SoroSuub Conglomerate and Dark Princess Xya Howie of Black Sun were aboard the YV-666 "Leap of Faith" the ship suffered catastrophic damage. The central computer on the ship was fried and provides no clues to this day what became of the pair but they are still missing, presumed dead. The Regent Tara Tylger stepped into the breach as the new Dark Princess but this was short lived. Princess Tylger's reign ended when she rampaged through the palace on Kiffex, leaving many dead. Regime changes are never a good thing for a group and it is readily apparent that Black Sun was, by this point, in crisis. Camaris sa Vinitta took the throne and the organization was sundered again. Predicting this eventuality a successor had been trained in secret and now stepped in to restore control to the fractured group, Dark Princess Daa`iata Tnaysc. During this period SoroSuub Conglomerate had pushed forward the creation of a massive city-world on Galalryn and eventually became the leading Galactic Government, replacing the Galactic Empire. 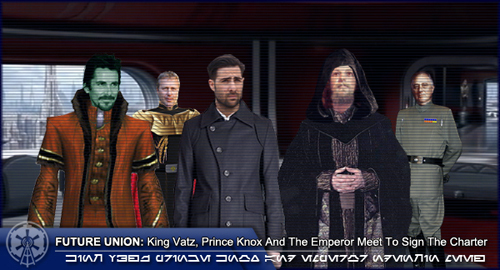 Count Ingo R. Vailis made a famous speech to the Galactic News Service, outlining his political views and pushing SoroSuub towards the Rebel Alliance and, eventually, the New Republic. Meanwhile, Count Adam A Flynn was heavily involved with Black Sun, supporting Princess Tnaysc's efforts to rebuild. Her reign did not last long and she handed control over to Prince Flynn. In such a short period Black Sun had undergone tremendous political turbulence. SoroSuub was willing to contribute massive amounts of credits to sustain the syndicate but to no avail. Rivalry among the remaining Family members made their position untenable and Black Sun was gutted. 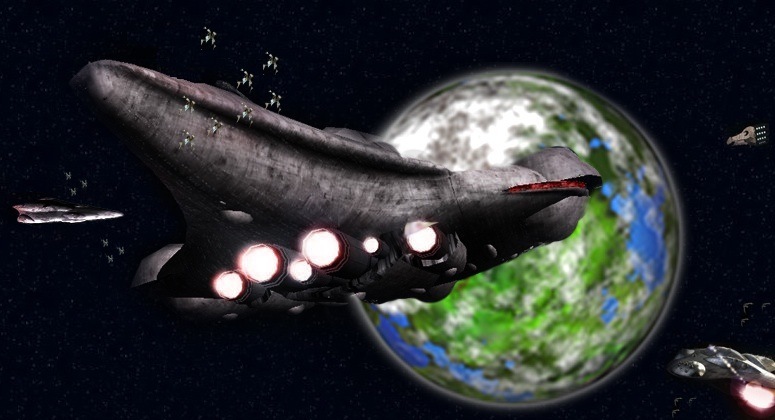 The group was held as part of the SoroSuub Conglomerate, stripped of all but its Kiffex holdings, the flagship Darkstar-class battleship and a fleet of vipers. Prince Flynn and Count Vailis debated its future at length but neither could afford to divert time from the furtherance of SoroSuub to repair the damage done to the Sun. It looked like the end. As events came to a head and SoroSuub merged with the Rebel Alliance to form the New Republic, Black Sun was forgotten almost completely. Prince Flynn and Count Vailis had never been able to answer the question of how to restore the group and so it languished, neglected. The New Republic outlined plans to transform Black Sun into Republic Trading. Severing the group from its criminal past and setting it on the course for a legitimate future as a trade consortium. Flynn and Vailis proposed a deal to sell the group to Teniel Djo with the hopes that a pirate could become a solid candidate as the new leader of organized crime in the galaxy. The idea of selling to a pirate sickened the moral majority in the New Republic. The Chief of State and leader of the Republic, Ingo R. Vailis, unable to reconcile his past and current identities or achieve his goals within the framework of the Republic, pushed on the deal. A last, desperate ploy to float something of the heritage which he felt a part of, rather than see it sink. The member body of the republic rallied against what they saw as unethical behaviour and, on Year 8 Day 310, they passed a vote of no confidence in Chief of State Vailis. Ingo secreted himself on Sulon and there he met with Adam A Flynn, Beauba Fettt and other key individuals to plan their response. It was time to correct the mistakes made with the Sun. On Year 8 Day 338 Chief of State Vailis began sending orders to Black Sun agents in the New Republic. He ordered the deaths of several key political opponents and the transfer of massive amounts of military technology and credits into Black Sun. He and Adam A Flynn worked closely together over this period and, by Year 8 Day 350, Dark Prince Flynn had ascended to the mantle of Black Sun, this time with the full intentions of restoring the crime syndicate to its former infamy. 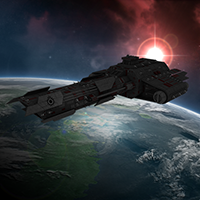 The first actions were to pull Black Sun's new warfleets back to Thyferra (a planet taken from the Republic) and begin organizing centralized military muscle on a massive scale while their leaders take time to plot the future course of the syndicate. Shortly after this point Black Sun begins pushing to reconstruct itself on all fronts. Ex-republic cruisers, now under the flag of Black Sun, and star-viper assault platforms move into Thyferran airspace. Year 9 Day 30 - Black Sun takes the decision to become a government in its own right, abandoning the facade of legitimate trade concern which has long since lost any credibility among the wider galactic population. Work begins rebuilding the famous Library of Black Sun as a central repository of all information in the galaxy, public and illicit. Plans for the development of Kiffex are unveiled with a view to creating a suitable capitol world out its current barren and neglected state. Recruitment of agents is pushed and new members are indoctrinated with the creed: Family. Honour. Profit. A creed no Black Sun agent should ever again be allowed to forget. "They live in the shadows, seldom known to the rest of the universe. They are people you know and trust. The people you trade with. The people you fight with. The people you buy drinks for. They are all linked, all members of the same Family. A Family not bound by blood, but by honour, and for life. A Family that will bring swift and merciless justice against any who betray or oppose it." - Creed of the Black Sun, Year 9 Day 30. After the events of the New Republic coup had calmed down, Corvis Orion having served an integral leadership role in the reclamation of the Black Sun identity, took up the mantle of Dark Prince in Year 10. Serving for nearly two years, his leadership is remembered for smoothing out political tides which had previously overcome the syndicate. Under Prince Orion, Black Sun had acquired The Azure Empire and opened other relations. The Sun also took steps to absorb much of Hyrotii Corporation's resources by indoctrinating Sector Managers and bribing Administrators, leading to its nationalization as a Black Sun company. However, as time went on, the reins of leadership appeared to be loosening and a decline had yet again set-in. Dark Prince Tar Alaks succeed Corvis Orion during this period of decline. In order to strengthen the ideological foundations of Black Sun, Prince Alaks had every member reaffirm their oath to the family. Alaks also succeeded in organizing a take-over of both Aurora Technologies and Aurora Mining Technologies which were absorbed into Black Sun. Aurora Technologies was reborn as a Black Sun nationalized ships producer. Alaks also relinquished the title of Dark Prince in favor of the title of Lord Marshal. Following Alaks stepping down, Dark Prince Banquo Knox began his rein, choosing to continue the return to the focus of Family within the organization. Additionally, Knox worked hard to keep diplomatic bridges open between Black Sun and other governments striving for a degree of legitimization. In keeping with these ideals, on Year 13 Day 209 Black Sun was renamed to The Veragi Consortium. However, the change in name would be a relatively short lived affair with it becoming Black Sun again on Year 13 Day 264. Throughout his galactic exploits, Dark Prince Knox had developed a diplomatic relationship with the Lord Seele of the Galactic Empire. The animosity of the past had seemingly been quelled by shared political, economic, and military goals. It was through this relationship, that Black Sun became one of the original signatories of the restructured Imperial Union, alongside the Tresario Star Kingdom on Year 13 Day 326. Prince Knox saw further legitimate success through the sale of Aurora Technologies, and the creation of a uniquely Black Sun shipbuilder, White Star. Eventually the stress of leading Black Sun through a large-scale shift proved tiresome for Prince Knox, his public appearances declining as he worked in seclusion. Though his initial focus had been on Family, Black Sun had not yet reconnected with its roots in brotherhood. With a promise to restore those ties, Princess Cait Catra was appointed his successor, though she would retire quickly and inconsequentially. Her wife Niobe Asha took the mantle briefly, under the title Empress, before also leaving a legacy void of historical importance. Though the failed Catra-Asha leadership only last for 120 galactic days, this period would simply be recorded as the, "Lost Year." Underlord Alexander von Ismay ascended to his position in Year 14, intent on repairing the failures of his most recent predecessors. Continuing the economic and diplomatic policies which had yielded success beneath Prince Knox, Underlord Ismay further pursued a revitalization of the ideals of, "Family. Honour. Profit." In ensuring these ideals were upheld, Underlord Ismay removed any members of the Collective and Family who placed others above Black Sun. This cleansing included the removal of Vigo Nyarlathotep Alaks and Vigo Jormungand Gand, both of whom were found to be traitors. In their place, loyal members of the Family were invited into Gologotha to serve upon the Family Council. Additionally, the White Star shipbuilding enterprise and Hyrotii Corporation were re-formed, in order to remove any remnants of the "Lost Year." In their place, Shobquix Industries, Neuro-Saav Corporation, and Gesenix Mining were formed, paving the way for the syndicate's future endeavors. Under the leadership of Alexander von Ismay, Black Sun dawned another golden age. Black Sun secured its place in a modern Imperial Union through stronger diplomatic ties, underwent massive infrastructure projects in Revyia which improved the collection of revenues, and boosted salaries and bonuses of Black Sun Collective members. The size of Black Sun's fleets more than doubled during his reign thanks to impressive efforts to boost production and industrial efforts across the Outer Rim. But the most memorable part of Underlord Ismay's reign will be returning Black Sun to its status as a galactically-recognized Government. When Underlord Ismay chose to retire his position in early Year 17, Black Sun had more than doubled its monthly income and had twice the number of dedicated Collective and Family members as it did when he became Underlord. Recognizing the potential of Black Sun to continue rising with strong and committed leadership, leadership transitioned to his Regent and Vigo of Defense, the new Dark Prince Jeor Knight on Year 17 Day 97. Lex von Ismay would then be induced to commit treason by his concubine, Kathlen Stewart, before making off with a small amount of credits. He forswore his Oath and was labeled a traitor, with a price on his head. Thus ended the reign of von Ismay and the rank of Underlord was retired in disgraced.